Distinguished Flying Cross with two Oak Leaf Clusters, Air Medal with two Oak Leaf Clusters, Bronze Star, British Distinguished Flying Cross, Chinese Air Force Medal and the Order of the Cloud Banner. Raised in the Los Angeles area, Charles Older graduated from Beverly Hills High School. He was student body president, active in several sports and is an Eagle Scout. He graduated from U.C.L.A., majoring in political science. Charles passed first in his class, U.S. Navy preliminary flight training in Long Beach and earned his Navy wings at Pensacola, NAS in April, 1940. Lt. Older served with Marine Fighting Squadron One and was qualified in gunnery, dive bombing and carrier landings. Chuck Older resigned his commission with the Marines and joined the American Volunteer Group (AVG) in August, 1941 and sailed for Burma. After training in the P-40 and receiving briefings on air tactics by Col. Claire Chennault, Older participated in the 3rd Squadron’s first combat on December 23, 1941 over Rangoon, Burma where he downed two enemy aircraft. He fought two days later in the Christmas Day air battle downing three more Japanese planes and becoming an ace. Before the Flying Tigers were officially disbanded on July 4, 1942, he would add 5.25 more victories to become a double ace with the AVG. 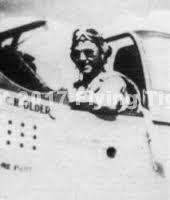 Upon returning to the U.S., Chuck Older joined the USAAF and went back to China in 1944 with the 23rd Fighter Group, 14th Air Force. He added to his AVG score with another 8 victories and led the first strike on Japanese forces at Shanghai. The mission comprised of 16 P-51s destroyed 72 Japanese aircraft with no U.S. losses. Charles Older returned home, leaving the Air Force as a Lt.Col. he earned a law degree from the Univ. of Southern California. He practiced law until becoming a superior court judge for Los Angeles. In the early ’70s, Chuck gained notoriety and earned prominence when he presided over the Charles Manson murder trials. After retiring, Chuck Older remained in the Los Angeles area, active in professional and community organizations.